Microsoft's quarterly earnings call on Monday showed in stark, mathematical terms, the urgency of the changes Windows 10 promises for the company's flagship operating system. Revenue in the business unit that includes Windows sales plunged. Even though two other key Microsoft products—Microsoft’s Surface and its Office 365 business—showed strong gains, profits fell by almost 11 percent. Microsoft reported net income of $5.86 billion for the quarter, or 71 cents per share, down from $6.56 billion for the same quarter a year ago. Revenue climbed 8 percent to $26.47 billion. Analysts polled by Yahoo Finance expected Microsoft to report 71 cents per share on revenue of $26.33 billion. But Microsoft’s revenue numbers are worse than they appear on the surface. On a business unit level (annoying abstract names are Microsoft's), the company’s growth was driven by its Commercial Other segment (Office 365 commercial, plus cloud products like Azure) as well as its Devices and Consumer Other (Bing, Xbox Live, and Office 365 for consumers). Microsoft also recorded $2.28 billion in sales of phone hardware, a business unit it did not have a year ago, and captured $314 million in revenue attributed to its Corporate business versus negative revenue of $55 million a year ago. Meanwhile, revenue at the company’s Devices and Consumer Licensing unit, which includes Windows and OEM sales of Office suites, fell by 25 percent to $4.17 billion. Margins in that unit fell by 22 percent. Lower-priced licenses to academic customers caused Windows OEM Pro revenue to drop 13 percent, the company said. Lower license revenue pulled down non-Pro growth by 13 percent as well. 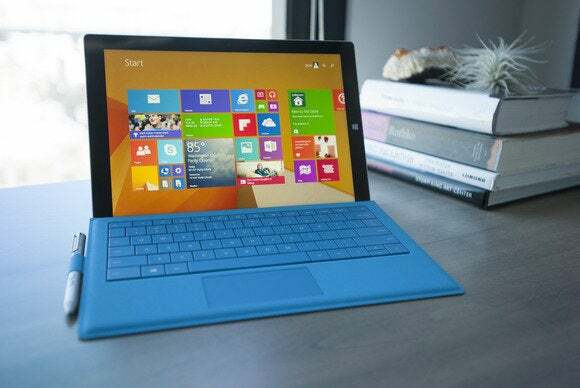 Nevertheless, executives focused on the positives: Devices and Consumer Other revenue, which includes the Surface tablet, grew by 30 percent to $2.44 billion, with sales of the Surface alone topping $1 billion for the first time. And sales in the Commercial Other cloud business more than doubled to $900 million. Office 365 Home and Personal subscribers increased to over 9.2 million, up 30% sequentially over the prior quarter, Microsoft said, and search advertising revenue grew 23 percent, with Bing's U.S. market share at 19.7 percent. Xbox sales topped 6.6 million units. Microsoft recently invited analysts and reporters to an event in Redmond to launch the latest technical preview of Windows 10. Microsoft is expected to launch the new operating system in the second half of 2015, following a steady rollout of preview builds that Microsoft has released for public evaluation. Microsoft will hold a conference call to discuss its earnings with analysts later on Monday afternoon, where it will provide a revenue forecast for its business units.